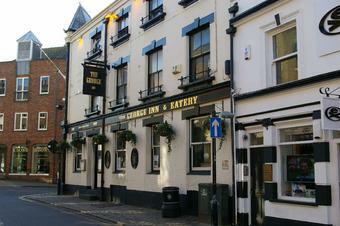 Nice comfortable pub, staff efficient, friendly locals, good beer garden, 6 ales on when we visited. I had Windsor & Eton 'Conqueror' [5%] a nice pint and Windsor & Eton 'Guardsman' [4.2%] a tasty ale. I stayed here and the rooms were clean and comfortable BUT rooms to the front beware as there is an 'unofficial' taxi rank outside where at the weekend there is high brow riff raff on the streets shouting and carrying on until the wee hours. Apparently it's £5 cheaper to get cab Eton side of the Thames - hence the taxi rank. The place itself though is OK and suprised to read comments about ale as the Windsor & Eton Brewery ale I had was excellent BUT £4 pint! There was also a beer fest due (local ales) the following day. Group of 4 visited The George Inn, last weekend. We had three glasses of Garter from Windsor & Eton brewery, all tasted of vinegar/acidic. Barman took a taste and declared that the ale was good. We left the beer and the expensive pub. Will stick to the Carpenters in future, where they know how to look after beer. Now the "Prince George". To paraphrase BinBagBob, this is a restaurant that doesn't even bother to serve beer, despite billing itself as an Inn. An average looking pub, but in a great located just a short stroll from the footbridge that links Eton and Windsor. 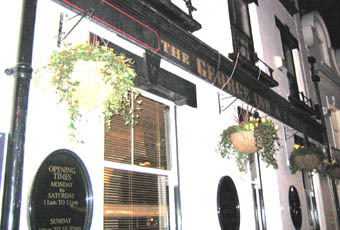 It has one large room, with an almost 'pretend authentic' look, with two real ales on the bar, including Guardsman from the Windsor and Eton brewery. It also had a large rear yard which, whilst not having a view of the nearby river, was a nice place to sit for an hour. The bar staff were very friendly and extremely professional. We tried the food and the swordfish was the best I have ever had, it was superb. The drawback to the pub had to be the price - £4.10 per pint, which would put me off returning in a hurry.